Derby 134 is made from a brown material with black button eyes and a white “stripe” on his face. 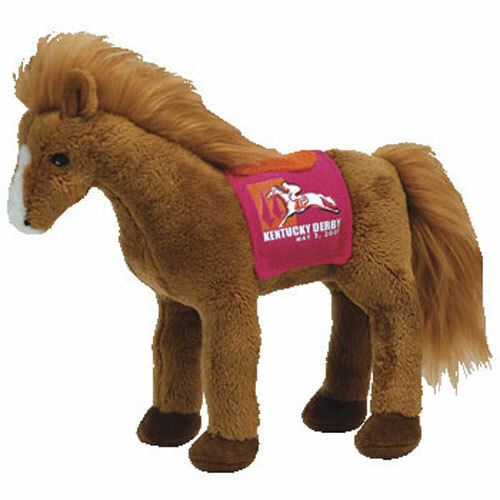 He has a fluffy brown mane and tail and on his back is a pink saddle pad with the Kentucky Derby 134 logo on it. At the end of the race, I’ll sure let you know! Derby 134 was released on 1st April 2008. His birthday is on 3rd May 2008. Derby 134 was released in this pink saddle Kentucky Derby store version, a retail pink saddle version, a blue saddle retail version and a Kentucky Derby store blue saddle version.